Danish physician; born in Copenhagen Oct. 26, 1821; diedthere Sept. 17, 1894. In 1839 he entered the University of Copenhagen, and was graduated in medicine in 1845. After having spent some time in foreign countries, he studied for two years at the hospitals of Copenhagen, chiefly at the Almindelig Hospital, and in 1848 became assistant surgeon during the insurrection in Sleswick-Holstein. The same year he took the degree of licentiate, and in 1850 that of M.D. at the University of Copenhagen. Subsequently he became assistant physician at the Almindelig Hospital, and later at the Frederiks Hospital, and for some years practised medicine in Copenhagen, being also district physician. In 1863 he was appointed chief physician in the first division of the Almindelig Hospital, and in 1869 received the title of professor. Brandes showed the greatest energy in philanthropic work. He was especially instrumental in founding, in 1859, the Kjöbenhavns Sygehjem, a home for incurables and the aged of both sexes in Copenhagen, and was its medical director for a number of years. He also founded a society for seam-stresses, which, in addition to giving relief, provided for the intellectual improvement of its members. He was for five years trustee of the Jewish congregation of Copenhagen. From 1873 Brandes endeavored, by means of classes and lectures, to improve nursing both in the hospitals and privately. Whereas formerly only women in the lower ranks of life had been employed as hospital nurses, Brandes induced those of the upper classes to take up the work. His paper on the use and abuse of alcoholic beverages, published in 1877, has made the restriction of their abuse a leading question. 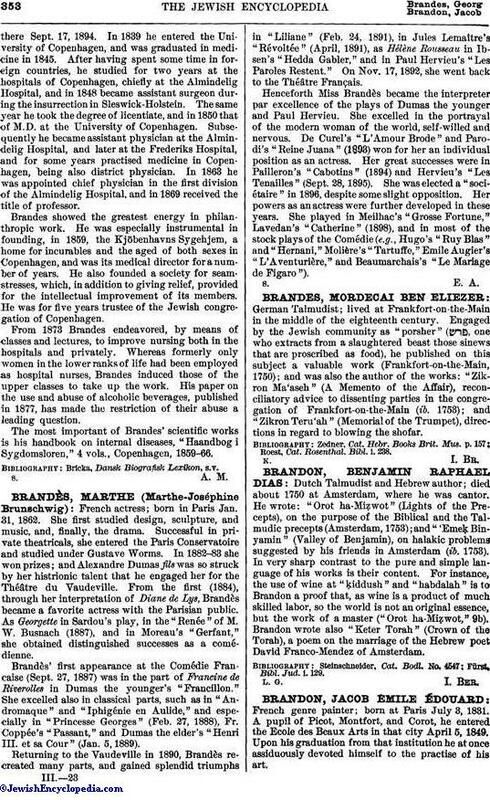 The most important of Brandes' scientific works is his handbook on internal diseases, "Haandbog i Sygdomsloren," 4 vols., Copenhagen, 1859-66. 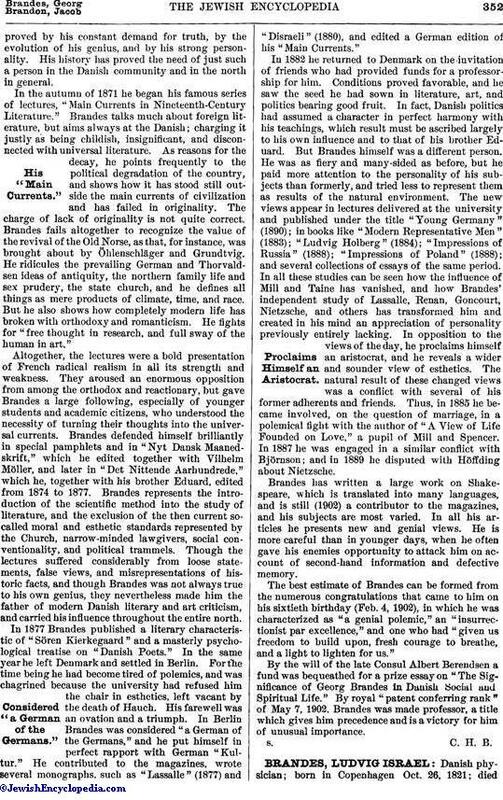 Bricka, Dansk Biografisk Lexikon, s.v.